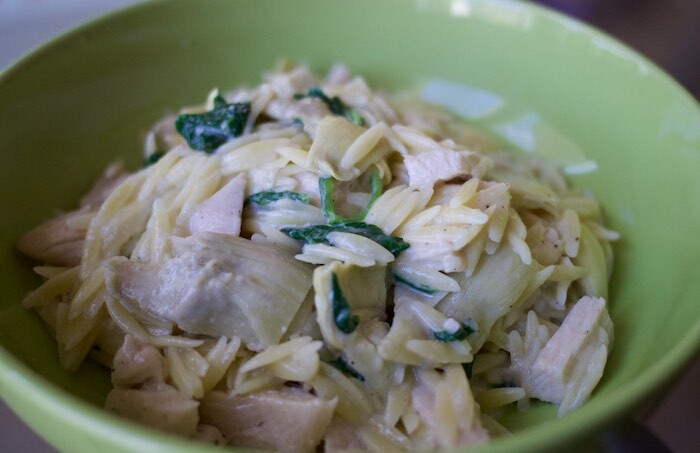 Looking for new ways to mix-up my weeknight dinner routine and still eat healthy I came up with this delicious combination of artichokes, spinach, chicken and orzo pasta. Similar to mac & cheese but much healthier, this recipe is easy to prepare and very tasty. In a large pot of boiling salted water, cook orzo according to package instructions. Drain well and set aside. In the meantime heat olive oil in a medium pan over medium heat. Add garlic and cook, stirring frequently, until fragrant about 1-2 minutes. Whisk in flour until lightly browned, about 1 minute. Gradually add milk, whisking constantly, until slightly thickened, about 3-4 minutes. Add spinach and cook until wilted. Stir in artichokes and Parmesan. Add orzo and toss to combine. Season with salt and pepper and serve immediately. I love artichokes! Sounds yummy! I need to make a low carb version with creamy spinach and artichokes! I can't get enough of artichokes...super fun in pasta! I'm with Lora, I just can't get enough of those amazing artichokes!! This is totally my kind of meal...pasta (of course), chicken, artichokes, cheese...delicious! I love all of the ingredients in this! Oh yes please. This looks wonderful. I love orzo!!! Loved seeing this Orzo and I wish I had some right now! Chicken, Artichokes & Spinach are so good together! Also I LOVE mac & cheese so I know I'd be all over this "healthier Version"! This looks great! Love the artichokes in this! Love this combination of veggies! What a light and pretty pasta dish!